A girl holds a ‘Peace for Paris’ symbol, created by graphic designer Jean Jullien, at a vigil outside the French consulate in Chicago, Ill., Nov. 15, 2015..
“It was a gut instinct,” Sable said Monday of his impromptu decision to play France’s national anthem. “It felt like a tiny tribute that I could pay to the people of France” after Friday night’s terrorist attacks in its capital. 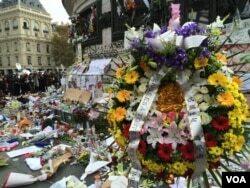 Spontaneous demonstrations of solidarity and empathy have been surfacing around the United States since Islamic State terrorists laid siege to six Paris sites, killing at least 129 people and wounding hundreds more. Across the United States, U.S. flags are flying at half-staff through Thursday in remembrance of the victims, on order of President Barack Obama. French flags are popping up – on flagpoles, on T-shirts and on social media. Facebook quickly invited users to shade their profile pictures with bars of red, white and blue. 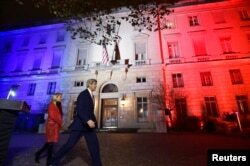 U.S. Secretary of State John Kerry (C), next to U.S. ambassador to France Jane D. Hartley, leaves after delivering a speech at the U.S. embassy in Paris illuminated with the colors of the French national flag, Nov. 16, 2015. He said he knew of other U.S. church musicians who’d planned to salute France by performing works by Maurice Ravel and other French composers. At Alliance Française of Chicago, the cultural organization’s second-largest U.S. chapter, well-wishers tucked floral bouquets into a metal gate and lit candles near its base. “It’s really lovely,” executive director Jack McCord said Monday. It was his first day back at work after a trip to Paris, where he happened to be at the time of the attacks. “I was having dinner on the Left Bank,” he explained, noting he “went back to my hotel and watched everything” on TV. He said sympathizers held vigils outside the French consulate in Chicago on Saturday and Sunday. The Midwestern city’s links to the French date back to at least the 17th century, when French-Canadian explorer Jacques Marquette came through the region along its waterways.